NEW ON THE RENTAL MARKET JUNE 2017 - New Inn nr Trearddur Bay on Anglesey VIEWS. Beautiful Detached House with NEW decked balcony enjoying views over open countryside situated at Valley, near Trearddur Bay, Anglesey: Sleeps 8. Pets WELCOME. This beautiful detached house enjoys a large enclosed grass garden to the rear - with patio furniture, bbq etc. - ideal for children to play and for pets. The numerous tourist attractions of this holiday island are within easy reach and the port of Holyhead from which you can enjoy a daytrip to Dublin is only 5-minutes drive away. Ample private parking. 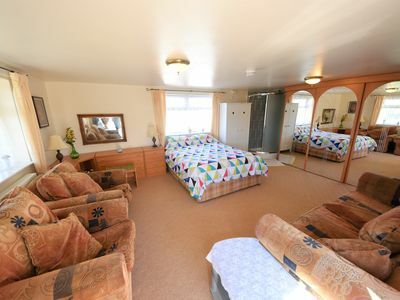 Owner has a caravan on site mainly for use as an office.